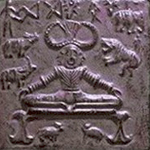 A friend asked me to write a series of articles on the Indo-Europeans for a private Yoga-oriented newsletter. Since the Druids were among the Indo-Europeans, there were lots of similarities between them and the other groups, so I got permission to share it here as well. This will be a general overview of the Indo-Europeans but I'm using the Vedic tradition as an organizing principle. I plan on covering all, or most, IE traditions. I plan on having several articles on the Celts and the Druids. Lots of food for thought in your blog. The comparisons are remarkable. Since the Druids were among the Indo-Europeans, there were lots of similarities between them and the other groups, so I got permission to share it here as well. Marvellous it's an interesting area, there is much of interest in the Vedas. "The ancient city", or by the proper ethymology of the name given to these peoples. Fustel de Coulanges do an importante reference to the old "The laws of Manu" from ancient India and also to a serie of others texts from greeks, romans etruscans, germans and few mentions of the celts. The book specifies the place and details about public cult or religion and private cult or religion. I posted Part Two of my article in a separate thread. Now I'm wondering if I should just update this thread instead. The articles will only be every 1-2 months so it won't be spammy. Is there a policy or preference on this? I think, adding a new post on this thread linking to the new post on your website, as you've just done for part 2, is probably the best approach. It relates Shiva to Odin, however I would say that some of Shiva's characteristics are Lokean. Thanks! I haven't read it but I added it to my wish list. I'm very familiar with Shiva, however, both experientially and intellectually.